Review: "Nevermore: This Godless Endeavor" - Sea of Tranquility - The Web Destination for Progressive Music! There are very few bands in metal that have consistently released one great album after another, let alone a string of albums that really touch on many elements of each metal sub-genre, yet really fall into none of them. Nevermore is one of these bands. These guys have managed to put a string of classic releases together, from Dreaming Neon Black, to Dead Heart in a Dead World, and then 2003's Enemies of Reality, the band's mix of thrash, classic power metal, death, and prog-metal has garnered them much acclaim and praise in the metal community. This Godless Endeavor will rank right up there with their last three releases, and just might historically wind up being a fan favorite among them, as this latest juggernaut of metal muscle pulls out all the stops. Featuring fantastic vocals from Warrel Dane, killer guitar work from mainstay Jeff Loomis and new guy on the block Steve Smyth (ex-Testament/Dragonlord), a pounding rhythm section from bassist Jim Sheppard & drummer Van Williams, and the crisp production from Andy Sneap, This Godless Endeavor is a sonic assault on your senses that will long be remembered and cherished. 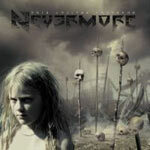 Guitar wise, this might be the most advanced Nevermore album to date, and that's saying someting considering how much excellent axe-work is contained on their earlier releases. Loomis and Smyth literally smoke on the melodic thrash workout "My Acid Words", and the duo's lethal licks perfectly support Dane's mix of histrionic and passionate vocals on "Bittersweet Feast". The band pummels the listener with doomy thrash on "Medicated Nation", injects some wicked Swedish melodic death metal sounds on "Born", mixes some acoustic interludes with raging metal on "A Future Uncertain", and gives us a fascinating prog-metal epic on the 9-minute closing title track. This one has it all-great drum work from Williams, Dane and his multi-faceted vocals, and plenty of intricate and complex riffs and solos from the team of Loomis and Smyth. This is a great CD, from one of the mainstays of metal over the last decade, who only seem to be getting better. This Godless Endeavor is sure to make many Best of 2005 lists this year. Check it out, and be sure to buy your Gigantour ticket so you can see the band perform a few tracks from this album live. Almost immediately after the release of This Godless Endeavor, Nevermore have been be cited as a band who have potentially released their career defining album. Given that this year in Metal as been a barrage of great releases and tours this is no easy feat to accomplish. Yet after listening to the CD I have to say that I agree with them. From start to finish this CD is a non-stop attack on the senses full of Heavy Metal power. They have come light years from their earlier releases and from their previous incarnation as Sanctuary and it's apparent as soon as "Born" begins. I enjoy singer Warrel Dane since he holds a powerful "clean" vocal while so many Metal bands all possess "growlers" in their membership these days. I lean towards the "traditional" Metal genre so this is a welcome change now and then. Jeff Loomis lays down some impressive guitar wizardry on the release and is to be commended but among the most standout work goes to drummer Van Williams. He is literally non-stop and very technical in his approach and does things with the drum kit that almost mirror the riffing insanity of Loomis. The two seem to play off one another more than I have seen done on some other Metal epics. It was quite intense to experience. Rounded out by Steve Smyth (guitar) and Jim Sheppard (bass) the group delivers this no-holds barred masterpiece. Smyth joins the band from Testament and this is his first recording as a member of Nevermore. The release is full of dark themes and ideals which are portrayed in tracks such as "The Final Product", "Sentient 6" and "This Godless Endeavor". Lyrically intelligent, this CD will make any listener stop to read the lyric booklet that is included with the disc. In addition to the words for the tracks there is page after page of ominous and stark artwork. It falls along with the theme of the release and adds to the mood that the band wants to set. It's important to know that while the CD is dark in content it is pure Heavy Metal and not the brooding Gothic or epic Operatic Arias. You are assaulted for almost 57 minutes and once it completes I am certain you will press play once again. If Nevermore has been a band that you did not look into in the past then now is the time to change that. This CD comes with the highest of recommendations and is sure to set some ground breaking records going forward. I look forward to seeing this album delivered in concert. In a community overflowing with countless unoriginal bands, Nevermore's Jeff Loomis and Warrel Dane have once again joined forces, with substantial help from their band mates, to create a vivaciously hard hitting and impossibly heavy album that has already set a new standard in Heavy Metal, raising the bar considerably. When you write music, you have the perfect opportunity to create something that nobody else has done before, and this is the case with Nevermore. They continue to expand on their trademark style, seamlessly blending aggression and melody, and enriching it with numerous off-time signatures, technically mindblowing guitar work, unmistakable vocals, and an atomic rhythm department, all kept within the classic Nevermore context. All that aside, This Godless Endeavor is easily the best metal album of 2005, and it seems very unlikely for any other release to surpass its brilliance, as far as the embodiment of pure and honest heavy metal is concerned. If you were (even slightly) disappointed in Nevermore's previous work, perhaps because of the poor production quality, worry not, your faith in the band will be restored. Nevermore's sixth member Andy Sneap is back, rendering the album its crisp and dynamic mix that makes the riffs the focal point of the album at the same time emphasizing Warrel Dane's vocals. Dane is quite possibly giving his best delivery, as he seems to have found his head voice more. His approach to singing is a bit different - he is more focused with melodies, sings with enormous clarity and conviction, and never ceases to move around in his range and go into notes and phrases that distinguish him from pretty much any other vocalist in the genre. His vocal patterns are some of his most creative in his career, and the best vocal melodies of the year have already been determined. The chorus of the opening track "Born", given the way it breaks into the song after a merciless death metal-type of riffage laid down by the Loomis/Smyth tandem, easily annihilates everything in its path. It's filled with melody, power and dynamics that will stick in your head the second you hear it. Every single piece has a huge chorus that doesn't seem the least bit out of place, be it "Final Product", "My Acid Words", "Sell My Heart for Stones", or simply the title track. Warrel Dane is back like never before. It is scary to think how guitarist Jeff Loomis has grown to such heights. He is quite possibly the best shredder in metal today - his playing continues to develop with each album and always experiments with profound musical ideas. His combination with Steve Smyth (ex-Testament) has proved majestic. Their riffage goes beyond the scopes of imagination, even unafraid to borrow from metal gods Meshuggah as on "Medicated Nation" with subtle stop-start passages mixing up with driving beats and thrash riffs. Besides the violent thrash meets death metal riffs, they also explore with dark acoustic guitars, best exemplified on "Sell My Heart for Stones", which is a bit evocative of "Deconstruction" off of Dreaming Neon Black. "Bittersweet Feast" also features some great acoustic work that breaks straight into an intricate riff amidst Dane's doubled vocals. Loomis adds some Spanish flair on the godly "The Psalm of Lydia", perhaps the song with the best intro and fastest drumming on the album. Van Williams is faster and more precise than a drum machine. I am lost for words about his performance on this one. "Sentient 6" is the sequel to "The Learning" from The Politics of Ecstasy. It is a haunting ballad with dual harmonic leads and a soothing piano melody. Dane's voice even sounds a bit like his work with Sanctuary. Appearing on the short bass instrumental "The Holocause of Thought" is James Murphy whose jazzy and experimental guitar solo feels like Death, Testament and Nevermore all rolled up in one song. The last two songs are also the most complex ones, particularly the almost 9-minute long title track. They are built like labyrinths that are filled with intricate passages of acoustic and electric leads, melodic vocal harmonies, a rock solid bass bottom, and riffs that must come from another planet. Pay attention to the masterful solo tradeoff on "A Future Uncertain" - this song is the true successor of thrash metal filled with moments of glory we'd normally expect to hear on Dreaming Neon Black. Arguably, however, it's the title song that marks the climax of this disc. Not only is it the best song on the album, it is bound to become a future Nevermore classic. Its sludgy build-up, complex shifts of rhythms, technically flawless lead guitars, and even a somewhat industrial death metal vibe happening near the 5:00 mark, this song is the epitome of metal of the new millennium. The CD is worth the price alone for this song. The only disadvantage is that listeners will be emotionally drained by the time they get to it, so they will have to play it repeatedly to form a solid final opinion. The cover art done by amazing artist Hugh Syme is dark and bleak. It aptly represents the subject matter explored on the album which, as with every Nevermore release, addresses the influence of media and religion on society, loss of innocence and spiritual unity, and the corrupt system we live in. Moreover, the artwork hints a similarity to Warrel Dane's fist band Sanctuary's Into the Mirror Black masterpiece, except that there is a young girl (who is actually Hugh Syme's own daughter) on the cover as opposed to an old man. Not only that, but musically the album also seems to harken back to Nevermore's The Politics of Ecstasy period with the whole band contributing to the songwriting process, including new guitarist Steve Smyth responsible for three songs. This has resulted in a more diverse-sounding record, as This Godless Endeavor proves to be a perfect mix of thrash, speed, death, and even dark power metal, all of the highest calibre. This recording needs to be re-released in a fashion that exhaults it's musical presence and panache. This is absolutely a classic and milestone in the genre. When you can remember everything from start to finish; played with amazing virtuosity to boot, you have a complete journey into excellence. Lets have a fold-out digi design with bonus tracks all in 5.1 surround, along with a bonus dvd that chronicles the making of this godly release!! !